Who can use InspectSystem and for what purpose? InspectSystem is intended for use mainly by business executives and managers to control and analyze the work of employees at the corporate workstations. The Cloud version is perfect for small and medium companies and remote staff management, while the Local version fits the needs of bigger companies with secured local networks and own server facilities. By using the service, you may define productive and idle time of your staff, control software usage to improve staff performance, as well as to maintain automatic hourly payroll accrual. Besides, InspectSystem may be used by freelancers and everyone else in need to analyze his/her own productivity, automate timesheet reports and hourly billing. Another target group is parents, willing to control their children’s activities at the PC. Why should I monitor employees? personnel security: track suspicious activities, prevent insider data leaks and collect evidence of breach. What do I need to start monitoring? 1. Sign up for the service and create your InspectSystem account. 2. Download InspectSystem client app. 3. Install the client app on the computers to be monitored. The number of supported clients is defined by the terms of the license. 4. Log in to your InspectSystem account and view collected data in your browser just in a minute or two after the client app installation. What is the "client app" and what is the "service"? “Client app” – the application (setup.exe), installed on a computer to be monitored. “Service” – web-server, which receives and processes data from client apps installed by the customer. Service functions as storage, processing, data management and remote application settings manager. Service is controlled via any internet browser. What are the limitations of InspectSystem web service? Your InspectSystem cloud disk space is unlimited. However, the number of monitored computers is limited by the terms of your license. Monitored computers must meet minimal system requirements and be connected to the Internet. InspectSystem can handle disconnections: the client app continues to record user’s offline activity and keeps the data locally. As soon as connection is restored, the data is sent to the server. How to download the client app? I can't see the download link. You have to be a registered user to download the client app and use the Service. As you log in to your account, go to Install tab and click Download. What OS / platforms are supported? InspectSystem client app is compatible with Windows 2000/XP/Vista/7/8/10 operating systems. Logging in and supervising is maintained in any browser, so there are no restrictions as to the supervisor’s platform. Does InspectSystem support Active Directory? Yes. Upon client app installation, employees’ and department names are taken from Active Directory database by default. 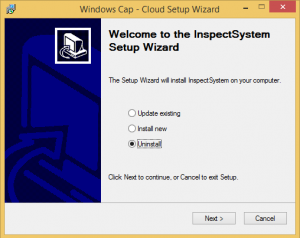 How to install InspectSystem on Windows 7/8/10? 1. Run setup.exe with administrator rights. You will see the notification, clicking “Yes” to continue installation. 2. The installation window appears. Press “Next” to start installation. 3. Read and accept conditions of license agreement and press “Next”. 4. Select destination folder for InspectSystem client app installation. The default folder is C:\Program Files\Windows Cap\. Press “Browse” button to select custom destination folder for installation. As you pick the folder, press “Next”. If your company uses proxy, click “Proxy” button to enter proxy settings. To exclude a certain user from monitoring, press “Users” button and pick user account(s) to be exempt from monitoring. 6. Everything is ready to start installation process. Press “Install”. 7. The result of installation is displayed. To complete installation and exit installation window, press “Finish” button. The program was successfully installed on the computer. Now you can disconnect the flash drive and check if monitoring data appear on the server. To do so, log in into https://adm.inspectsystem.com using your login and password. How to make InspectSystem work via proxy? Indicate server IP and port in the “URL Settings” window. If authorization is used, enter proxy login and password. Press “Check connection” to make sure everything is ok. If the settings are entered correctly, “Connection established” notification is displayed. After successful test, click OK in “URL Settings” window and continue installation. To customize proxy settings, repeat installation once again with the above adjustment procedure. How to exclude users from monitoring ? If there are multiple user accounts on the workstation, e.g. Administrator and User, and it is not required to monitor the Administrator account, you may opt to exclude the account from monitoring. In the process of installation, at Configuration stage, press Users button. Add the accounts that should NOT be monitored, to the list of exceptions. Press “Add” and insert login using semicolon (option A) or indicate user from the list (option B), press “Add”. OPTION “A” – Input users manually. OPTION “B” – Select user from the list. Press “Find” in “Choose Users” window to view the list of all local user accounts on the computer, pick the “Administrator” account (or those that do not have to be observed) and press “ОК”. To choose several users simultaneously, select them in the list while holding Shift button. After adding all exceptions, continue app installation. Press OK and Next and proceed to the end of installation, as prompted. Press Finish after installation is complete. We use terminal server, can the service be used in this mode? Yes, InspectSystem is fully functional on Windows terminal server. In this case you will need to install a single instance of the client app to track and monitor all users connected. However, in terminal mode one license corresponds to one server account. 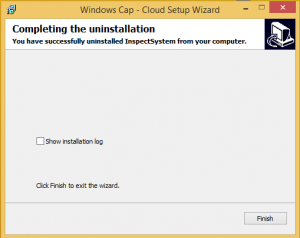 How to uninstall InspectSystem client app? In order to protect the client app from deletion and interruptions, it is not listed in the Add/Remove programs list and hence can not be deleted by Remove program option. Run setup.exe as an Administaror. Select Uninstall option and press Next. Confirm removing by pressing Uninstall. 1 license corresponds to 1 personal computer (PC) or 1 terminal server account. Example 1: A PC is used in turns by several users. You will need 1 license to control all those users. Example 2: You have hired a new employee to work at the PC with InspectSystem client app installed. You set up a new user account on the PC, and once the new employee starts using it, his/her time tracking and monitoring data is automatically transmitted to InspectSystem server. Example 3: You have to reassign the license to another PC, e. g. in the case of hardware modernization or changes in personnel. No problem! Just log in and use Reassign license function in your account settings. No additional license is required in the case. After web service subscription is terminated, will the server keep my data? Yes. After subscription term is over, your account is not removed from the server but remains in standby mode. Your client apps stop transmitting new data, but the activity data you’ve collected earlier stay on the server for at least 12 months. If you decide to resume monitoring, you do not need to register again, just log in to your account and proceed to license renewal. You don’t need to reinstall the client apps to use the new license – they will just start transmitting data again. What user data is monitored and saved by InspectSystem? Software activity logs: name of the software, usage timesheet, window titles. Skype, ICQ and other messenger logs. However, sometimes the above data may become visible on screenshots and thus be available to supervisors. Can you help with InspectSystem installation? Sure! If you’re experiencing trouble with installation, please don’t hesitate to contact our support. I have a deputy and HR manager, can they get an access? Yes. Assign authorized officers as supervisors using pre-set supervision roles: Director, HR Manager, Department Manager or System Administrator. Each role has got different set of permissions in the system. Can I use the system just to track working time? Yes. Register with the service and pick InspectSystem Basic. Is it possible to disable screenshot recording for chosen users? Yes, it can be done in System Settings. Can I connect several offices into one monitoring system? Yes. As a Web service user, you can monitor remote offices worldwide. You can install the client app remotely or locally. Does office relocation influence functionality of the system? Not at all. InspectSystem functionality is not affected by changes in IP address of monitored computers. The server recognizes clients by MAC address, so network configuration does not matter. Internet connection failures, how will they affect Web service functionality? The program will work in offline mode. If the connection is down, the client app will store data locally and synchronize with the server as the connection is restored. Thus all data for the offline period will still be available in the system. There is a time shift in employee's timesheet for one or more hours. What is wrong? Adjust the employee’s time zone in InspectSystem account or on the employee’s computer.